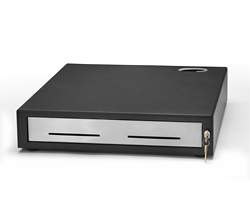 MMF’s cash drawers are the ideal solution for non-cash transactions. Customer checks, courtesy checks, money orders and credit card sales receipts can be conveniently and quickly deposited. Simply slide media through the front slot… no need to open the cash drawer. *Intended for use with the MMF POS Platform below.